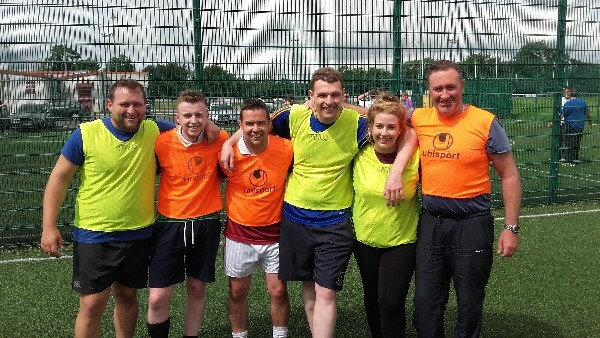 On July 29th 2016, Nua held their annual Nua Soccer Tournament at the Ballykelly GAA Club in Monasterevin. Hosted by The Meadows and The Fairways houses, their Service Users and staff were up bright and early Friday morning to set up for the day before the arrival of everyone. At 11.00am Ballykelly became very lively with lots of happy faces arriving for the fun day ahead. Lots of Nua houses attended in large numbers and generated a great atmosphere from the get-go. Some Service Users opted for the bouncing castles, others signed up to participate in the soccer tournament. From kick off at 11.30, 10 Nua houses participated in the soccer tournament which began with a group stage and then the winners of the groups were through to the knockouts. Everyone on the field seemed to be having a ball but at the same time everyone was showing their competitive side and was determined to win. The MC for the day was JJ Carey who was announcing and organising the games that were being played on each pitch at certain times so everybody knew what was happening. The group stages of the games went on until 1.30pm. There were some fascinating competitive and friendly games played throughout the course of the day and everyone really seemed to enjoy themselves! At 1.30pm the entertainment kicked off which was provided by Sean Murphy and Ken Farrell. Sean Murphy entertained the crowd with his guitar and vocals which everybody loved and some Service Users even got up and joined Sean on the microphone and had ball. Sean had lots of people up dancing keeping everyone’s legs warm from the wind for the second half of the soccer tournament. At 2.00pm a lovely spread of food was displayed and dished out to everyone, provided by Robert Bergin Food. The grounds became a lot quieter at this time because everyone was digging into the lovely wide selection of foods and entertainment from Sean continued throughout. At 2.30pm the Soccer Tournament recommenced to the knockout stages with the dwindling teams getting that bit closer to getting their hands on the big trophy!! A more competitive atmosphere now surrounded the field with everyone wanting to win and giving it there all. Everyone participating in the games really seemed to be getting into and enjoying it as well as the big crowd watching on and cheering for the players. Two teams came out on top from the knockout stages to reach the Final of the Nua Soccer Tournament - Kilbride House and The Fairways House. These two teams were very strong sides on the day and fully deserved their places in the final of the cup. The final kicked off at 4.00pm with a large crowd watching on in anticipation to see who will come out on top. It started off very unpredictably for both teams but Kilbride House finally broke the deadlock with a goal after a couple of minutes. Kilbride doubled their lead shortly afterwards with a great goal from David Doyle. However, the strike of luck didnt last with Jamie Delaney from The Fairways bringing the Fairways back into the game minutes afterwards to make it 2-1 with his great goal. Kilbride then pulled away again with two minutes to go with a goal to make it 3-1 scored by John Nash Hogan. The full-time score from the game was 3-1, both teams gave it their all and seemed to really enjoy the game. Both teams congratulated each other afterwards and Kilbride House were ecstatic with their win. Kilbride House fully deserved the win on the day and were a very strong team who everyone will be looking to beat next year. At 4.30pm MC JJ Carey announced all the houses that participated to come and collect their medals. Everyone was extremely pleased collecting their medals and there was a great sense of achievement for the many participants. JJ Carey then announced the Player of The Tournament who was giving to Jamie Delaney from The Fairways House who had a fascinating tournament and really gave it his all. Jamie had a huge part to play in his team reaching the finals and should be extremely proud of himself. Second place, The Fairways, were then called up to collect their plaques and medals for their great participation in the tournament. Last but not least, Kilbride House were called to collect the big Nua Annual Soccer Tournament Trophy. David Doyle lifted the trophy up high in front of the large crowd and seemed extremely happy and proud to do so. All the members of the Kilbride House were evidently over the moon with their win. The names of the players on the winning team were David Doyle, John Nash Hogan, Daniel Doran, Adrian Stynes, Jamie Lawlor and Stephen Lawlor. A huge thank you to everyone that came and participated in the day, it was huge success and everybody really seemed to enjoy themselves. A special thanks for all the houses that came and to everyone that made it an enjoyable tournament for all. We look forward to seeing you there next year.